Please contact us with the contact form to report difficulties, strange behaviors or persistent problems, and quote the program name or the number 22910 . This is the download page for Exiland Backup Free - Exiland Backup Free is a free and powerful file backup software, that allows you to make backups of your important files. It is extremely easy, small and fast, taking just a little of system resources. It is an ideal backup solution for desktop and laptop computers, for your business or personal use. The program save backups to any storage locations: local or network drives, SSH, FTP, NAS servers, removable media (such as flash drives or external HDD). 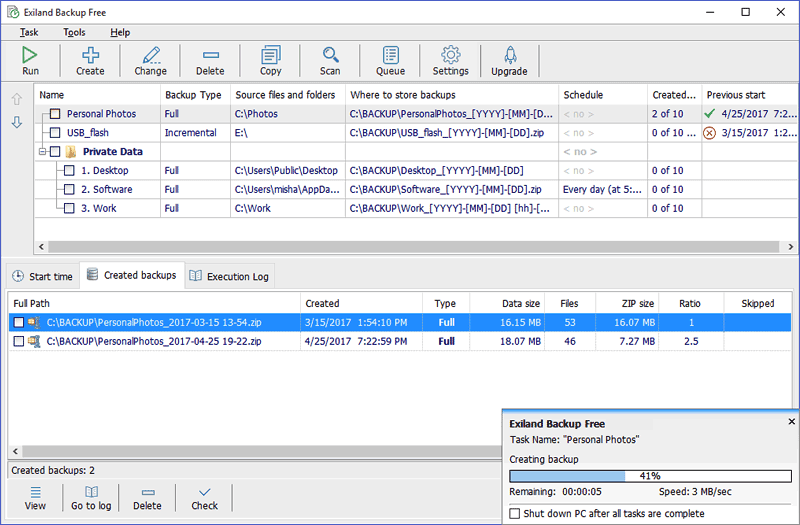 Exiland Backup saves your disk space by compressing the files included in backups. You can download Exiland Backup Free and use it free of charge.